This post would qualify as a part of the “back to the basics” series. While cloud-based business software has gained mainstream adoption over the past couple of years, many companies are dipping their toes in it for the first time, and are still asking the “why” questions. 4) Spur Collaboration. Modern intranets have collaboration and social tools built into them. Not only can employees access work-related information, they can also share and work together on it within the intranet. Networking tools allow employees to discover the skills and competencies of fellow workers and bypass corporate hierarchies to connect with them directly. Yeah, so everyone tells us we need an Intranet to turn our business around. But, what even is an intranet and what can it do for a company? Technically, an Intranet is a private network for organizations, intended to share information securely in a way that is restricted to just employees. It’s one of the must-have tools for internal communication, especially in medium and large-sized companies. A good onboarding process leads to higher employee retention, faster ramp-up, and employee engagement. This is one of the most common use cases, with one study finding that62% of companies use an Intranet for employee onboarding. Essentially, an Intranet lets employers and HR department to store must-read documents and craft a journey that lets employees understand about a company to start being engaged and productive. Accounts creation forms: Wi-Fi password, corporate email address, phone line, company social accounts. Usually, companies rely on emails for the whole hiring process; the applicant contacts a company through the email jobs@yourcompany.com and the recruiter replies with an interview scheduling link if the profile qualifies (or a “thank you, see you” if it doesn’t). If you are an organization with a lot of churns, this quickly becomes unmanageable. However, the hiring pipeline can be visualized in an interface and automated through workflows. 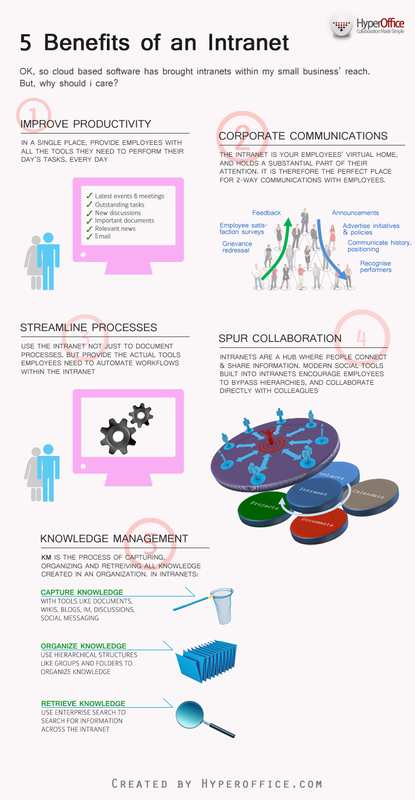 Let’s take a look of how an Intranet can handle each step of the pipeline. Sourcing: You can create a set of web forms for applicants then identify the source they came from. For instance, you can send your employees a unique, trackable web form link to send to friends then reward those who refer a qualified candidate. After all, referrals are the main source of hiring—despite options like job boards and LinkedIn. Candidates qualification: Save time choosing candidates by building surveys and workflows based on candidate responses. Tests: Reply to qualified candidates with a technical test and interview scheduling form. Offer: Share acceptance and job description offerings privately with qualified contacts. Acceptance: You can give external access to your Intranet (i.e. Extranet) to the candidates who have accepted the job offer, and seamlessly invite them to initiate their on-boarding process. Your intranet can be the perfect place for everyone in your organization to stay up to date. For instance, you can remind everyone about a co-worker’s birthday or anniversary, an important conference, public holidays and important meetings. By displaying them on the corporate calendar, they are accessible to everyone. Clearly communicating feedback with your employees, and your employees sharing feedback with you, is incredibly effective for boosting productivity and morale in the workplace. It is a vital element for any company to incorporate, but many businesses fall short of doing it. In fact, 62% of employees don’t think they get as much feedback as actually needed. Automate weekly or monthly feedback surveys for your employees by creating forms and workflows. Bes used as a social module to start private conversations with your employees; it’s direct, personal, and you can record all insights in one place. Be used to create a 360 survey web form to let all your employees anonymously give feedback to a specific individual and save it in a employees internal directory. HyperOffice’s social module and Ushare.to’s workplace online chat enable space for promoting Ice-breaker activities, through built-in features such as video meetings and private and shared chat rooms. Corporate meetings are generally crowded by documents. So many that, in the end, most of them become useless. Emails, for instance, can diminish important notes and documents in a flooded inbox. This is why document management and Social Intranets play a key role in many organizations for organizing and documenting meetings. Intranets allow users to create views or specific pages where users can store and share documents with ease and customize access for different individuals within the company. Thus, documents like action sheets, progress reports, and presentations can all be gathered in a single, private place. Tasks creation and assignments with subtasks, responsibilities, roles, descriptions, statuses, dates, etc. Automatic notifications: deadlines are met, finished tasks, or assigned tasks to somebody. You may know notes software like Evernote. However, instead of personal notes, you can share and create notes with your team, privately inside your Intranet. Intranets can be edited to create a monthly “hall of fame” or highlighting cornerstones and achievements a team or an individual reached, encouraging everyone to do the same. Also, HR departments can track each individual performance by creating a database web app where performance data is stored and rewarded accordingly. A corporate contacts directory becomes a need in large organizations where it is complex for departments to make specific requests to an individual in charge. HR is constantly contacted for training or hiring requests and IT is requested to fix bugs or come up with new solutions for automating tasks. The purchase decision is hard. A specific department may need them, but they are only approved by the purchases area. For these cases, companies build forms and social spaces where teams can discuss requirements to make decisions together, faster. Non-IT users may easily find bugs the IT team didn’t notice. After all, many internal apps are used by other departments. For quick resolutions, you may consider a module, a chat room or a form where bugs can be submitted to technicians who can solve the issue. It is hard for both employers and employees to coordinate an absence; people in charge need to find someone to replace the missing spot and track when an employee is actually allowed to request to leave temporarily. For this, again, companies can set up custom forms and virtual spaces in an Intranet instead of looking for a solution for such a specific problem. Companies that transition to cloud-based digital technologies start noticing that they become flooded with passwords they need to remember. As a consequence, very sensitive information and applications are often protected by simple, insecure and overused passwords. With Intranets, each user can create private modules where corporate passwords can be stored. This offers a practical and affordable way to reinforce corporate privacy and data security. Call centers and online chat managers can request instant support inside a communication hub or online chat. This way they can ensure fast, accurate customer support to any query, regardless of the department involved. 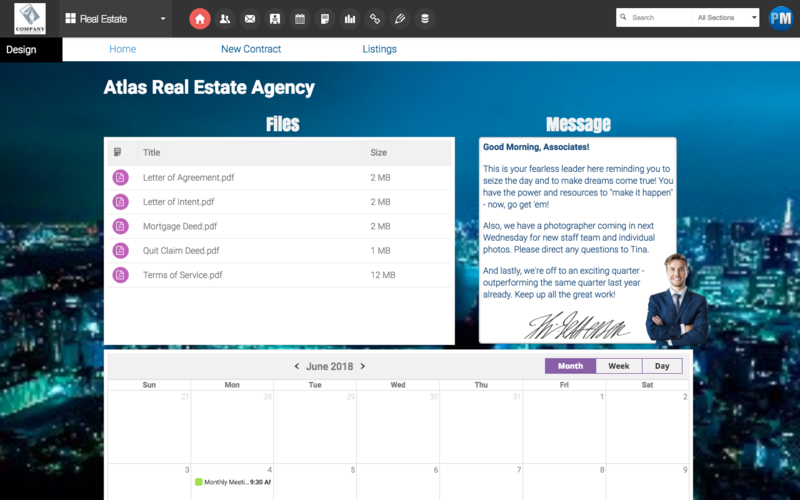 As you can see, an Intranet works like an ecosystem; it is an all-in-one platform that allows organizations to gather multiple custom applications in a single place, allowing the company to streamline its growth and save money. The problem that many companies that are starting to implement collaborative software is that they find their operations broken down in non-tailored, specific apps. Your company and employees have different and varied needs for each dependency and, if not controlled, the large flow of information may eventually become decentralized. As organizations grow they need to make sure they obtain an incremental margin on each newly hired employee. But this doesn’t happen. We tend to believe that there’s a direct relation between the number of employees and the productivity, but the marginal growth in organizations of hundreds of dozens happen to be negative; companies hire but they struggle to articulate each individual and to track each one’s performance. Data integrity refers to the good practices involved to make sure the data is reliable and accurate during its collection, processing, visualization, and analysis. This is real. I have already several organizations —especially those with legacy systems— that struggle to extract value from the data they generate and they are even looking for professionals who help them sort out to organize such data. In fact, the Chief Data Officer role is not unfamiliar for large organizations. However, with fragmented working systems, most of the time spent by data teams will be allocated for cleaning, not analysis. Centralizing all the documents, projects, tasks, calendars, or any business information flying around prevents companies from losing data, manage accountability, avoid leakages, and track every incoming or outgoing data flow. Ensuring all operations happen in an intranet—in a single place—helps companies to control and oversee all the information managed. If you want to start unleashing the value of Intranet, we would love to work with you by building your first one for free. Click here to learn more about this limited time offer. Is your team considering Intranets are no longer worth it? or how to know if your company actually needs one?, see Is the corporate intranet dead?